Valerian (Valeriana officinalis) has been used as one of the primary sedating and calming herbal remedies since at least the sixth century. Its use has been established as a non-addictive sleep aid throughout the European Union. A portion of its activity is associated with the compound valerenic acid. 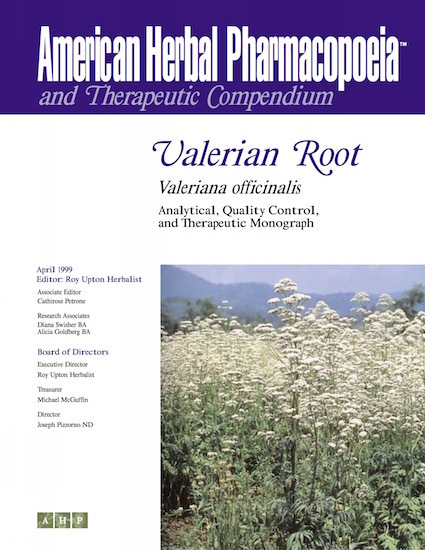 However, valerenic acid only accounts for approximately 25% of the activity of the total extract, meaning that up to 75% of the activity of valerian is unknown. On the quality side, valerian is part of an aggregate that encompasses numerous species and chemotypes. There are a number of other species outside the aggregate that must be differentiated from the acceptable aggregate species. There are some concerns regarding the potential of both positive and negative interactions between valerian and conventional medications, predominantly sedatives. Both of these issues are addressed in the AHP monograph. 2-3 day domestic US mail Priority is used for shipping hard copies.